U.S. installations of solar power equipment fell by 8.8% on a year earlier in the second quarter, S&P Global Market Intelligence reports, as a result of uncertainty caused by the implementation of section 201 duties on imported solar panels. 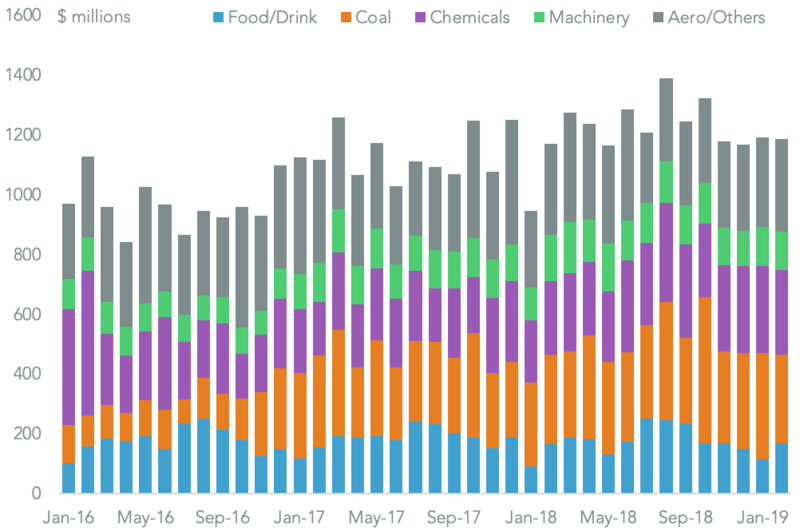 Yet, a recovery in demand and adjustment to the tariffs has meant a record 8,500 MW of new projects have been booked in the first half of the year, in part as utilities look to secure subsidized returns ahead of the 2020 end of the current tax support period. That also reflects the relatively low proportion of duties within the overall cost of installing a solar power plant at around one third of the total, as outlined in Panjiva research of July 24. 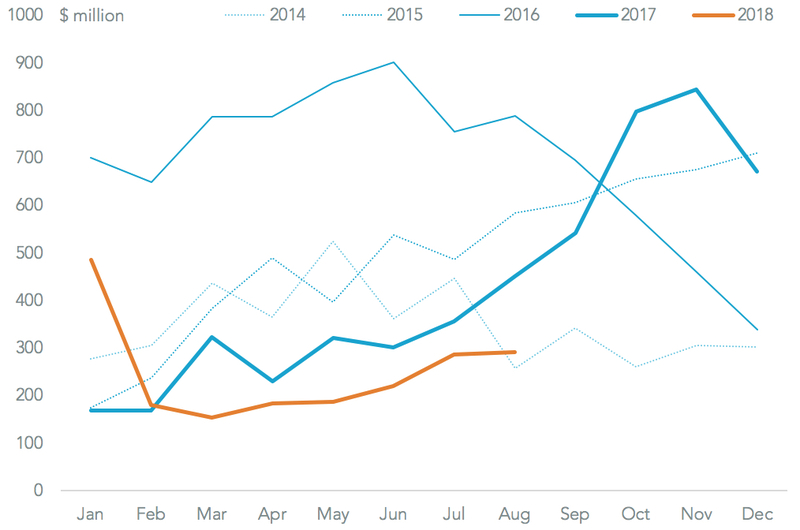 Panjiva data shows the 30% tariffs implemented at the end of January have trimmed rather than crushed imports with shipments in the March to August period, including seaborne shipments for the most recent month, down by 33.3% on a year earlier and by 54.0% vs. 2015 levels. 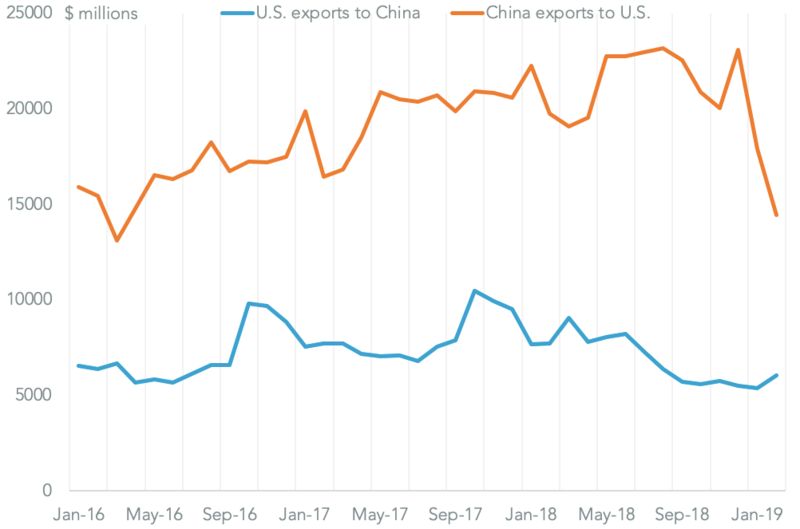 The period of “country hopping” by manufacturers facing a wave of antidumping duties – particularly against China – that precipitated the section 201 case (which covers all producers) appears to have stabilized. The top three supplier nations, on the basis of $1.2 billion of imports in the six months to July 31, were Malaysia (33.2%), Vietnam (10.7%) and Mexico (11.6%) with a long-tail of production in other countries. A further evolution is likely as the large utility projects come to fruition. That may come in fits and starts as projects only have to start construction rather than be completed to be eligible for a given year’s tax credits. 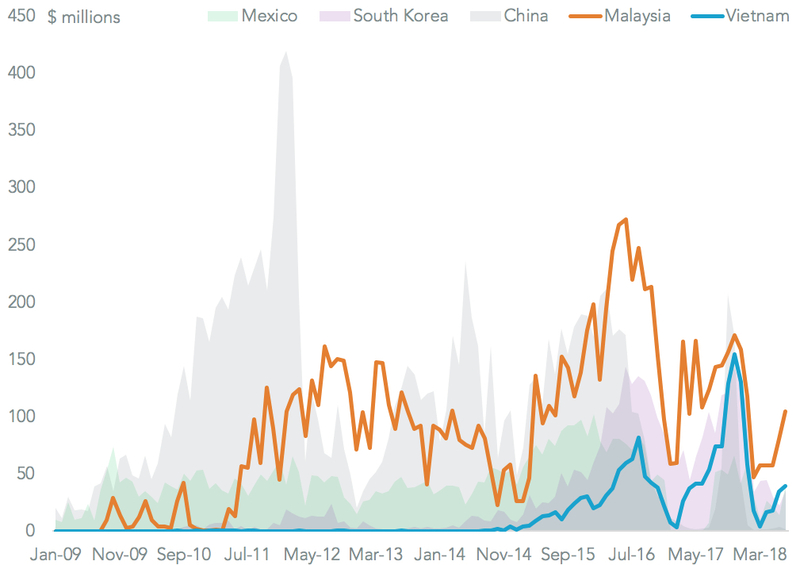 The largest importers by sea in the past six months have been Boviet (19% of imports) and Vina Solar (16.8%) from Vietnam alongside Longi (14.7%) from Malaysia and Trina Solar (13.0%) from Thailand.